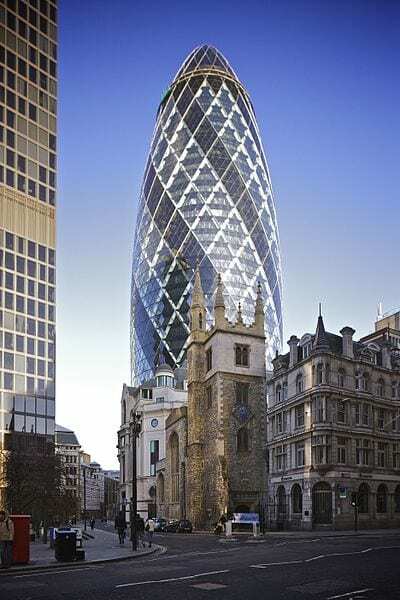 Home » Blog » Countries » Featured Articles » History » London » UK » Circling the Gherkin. London, UK. As my train approached London Bridge I spotted 30 St Mary Axe, better known as the Gherkin. It’s hard to believe that this famous London landmark, designed by Sir Norman Foster, was only opened in 2004. 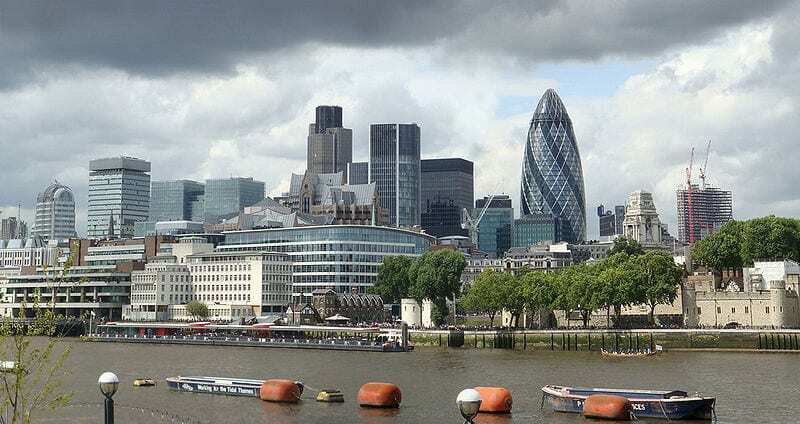 It seems to have been an important feature of London’s skyline for ever! I had a day to kill in London and I didn’t know what I was going to do. Suddenly, I had an idea. I was going to get off the train and just walk and explore! It’s something that I never have a chance to do. Leaving the station, I walked towards London Bridge. The Gherkin had disappeared. I walked along London Bridge (it’s not falling down. Sorry! See my Norway article for an explanation,) and caught a glimpse of the top of it. I was on the wrong side of the road. The road was deserted, but I hesitated. Was I allowed to just walk across it, or did I have to use a crossing? Well I do live in the Sussex sticks! Plucking up my courage, I dashed across. At the end of the bridge I turned right. In front of me was a tall column. What was it? Drawing nearer, I read the sign. It’s just called The Monument; built to commemorate the Great Fire of London in 1666. It stands 61 mts high, exactly 61 mts from Pudding Lane, where the fire started. Sir Christopher Wren designed it of course. It cost £13,450 11s 9p. I was surprised to find out that it’s hollow. 311 spiral steps take you to the top, where a platform gives a 360 degree view of London. I decided to pass on that until another time. Thousands of houses and 87 churches were destroyed in the fire. 100,000 people lost their homes, but only six deaths were recorded. It took over 50 years to rebuild London. Of course it was a terrible tragedy at the time, but the year before, 1665, was the year of the Great Plague, killing thousands. Plagues were a regular occurrence, but that was the worst. The Great Fire cleared London of the sewage and disease-riddled streets. It was a chance to build a New London. I walked on, past Pudding Lane and turned right. The Tower of London appeared on my right. I could just see the top of the Gherkin in front of me. There was a church on my left. Southwark Cathedral. It’s the smallest cathedral that I’ve ever seen. There’s been a church on the site for over 1,000 years and there was a Roman villa before that. Part of the villa is visible on the floor. In 1977 a well was found, with a pagan statue in it, dating from the 4th Century. Two minutes away are the remains of Winchester Palace, which was connected to the Cathedral. There was no sign of the Gherkin. Crossing the road, I passed a stunning building that looked as though it should be Something, if you know what I mean. A man told me that it was Trinity House. It was derelict, but was being renovated to become a 6-star hotel. Good. Another man directed me to the Gherkin. Down a cobbled road and then turn right. Right? I could have sworn that it was on the left! And there it was, in front of me. As I stared up at it, I knew that I was looking at London’s future history. Beautiful’s not the right word. Unique sums it up. 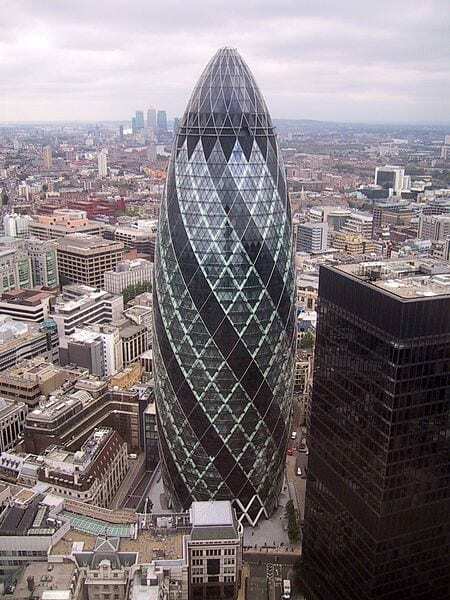 Modern buildings can be an eyesore, especially placed in the middle of historic areas, but the Gherkin somehow blends in perfectly. It was time to eat. There’s a large restaurant at the base of the Gherkin, but I decided to move on with my quest. Eating out is a problem for me as I’m allergic to E numbers and chemical additives in my food. Turning right, I walked along to where Aldgate Street and Fenchurch Street fork off. I recognised the triangular building jutting out. The layout there has been exactly the same for centuries. Walking along, I inhaled the chemical odours of commuter food-on-the-hoof. I asked a lady a good place to eat and she directed me along the road and second on the right to the Lloyds building. (It’ll be alright when it’s finished.) And right next to it is Leadenhall Market. Why isn’t it one of London’s top landmarks? It’s absolutely mind-boggling! It must have been built when the Victorians were in their Oriental Period. It could have been a bazaar. The colours are bright and bold, and in excellent condition. It’s full of boutiques, French patisseries, Havana cigars, chocolate shops and restaurants. It makes Covent Garden look dull. Stalls in the middle sell cakes and takeaways, for very reasonable prices. Curry and rice for under a fiver. I found a place, just called Butcher. It’s half butcher’s shop and half restaurant, with a very busy takeaway, outside it, but inside the market, if you know what I mean. A huge wrought-iron structure with large spikes hangs along the wall above head-height. It’s where they used to hang the meat and game, especially at Christmas. Here we go, I thought, the bit that I always dread. I asked the butcher (Alan) if the food was all made on the premises. I fancied the lamb shank with parsnip mash and lamb gravy for £7.50. But I had visions of lamb shanks in a box that keep for 6 months. I wouldn’t dare go near one. And he proudly told me that all their meat was free range. Then he checked with Carmine the Italian chef that nothing had preservatives. Oh, ‘eck! Here comes the chef! But he just smiled and asked if I was allergic to flour or anything like that. No I’m not; just chemicals. The food was faultless. There was even a drop of red wine in the gravy. 5-star service for 2-star prices. Out of the market I went along Lime Street and turned right, then left along Fenchurch Street. No sign of the Gherkin. I felt fine. No bloating, blocking up or acute lethargy. Oh the joys of eating Proper Food! A sign said that Tower Bridge was on the right, so I walked towards it. To the left is Tower Bridge House, which looks as though it’s built of glass. I went in the huge foyer and watched the glass lifts going up and down. The security guard told me that only a few businesses rent the lot, including a Japanese firm and solicitors. I can’t imagine their rental fees. It must cost a fortune! Note to self; if you need a solicitor, make sure their address isn’t Tower Bridge House! Down the hill, to the left of the bridge, is St Katherine’s Docks, a haven of peace, just a few yards away from one of London’s busiest areas. The only sound was a duck quacking between the expensive private boats. What on earth are they doing in the heart of London? It’s a strange place for a marina! You cross flimsy bridges that take you past designer shops and old marine buildings. The Charles Dickens pub is almost covered with flowers. Back to Tower Bridge. I passed underneath it and walked along the cobbled path with the Tower of London on my right. My feet were beginning to ache. At the end I could see the Gherkin, but it wasn’t in the same position that I’d seen it in earlier! I retraced my steps. Follow the yellow brick road; well, the yellowy-grey brick road. What do you call a group of Japanese tourists? A traffic jam. Battling my way through them and up the steps onto Tower Bridge, I walked across it. I’m a bit embarrassed to admit that it was the first time I’d ever been over the bridge. Actually, I think I’ve driven across it, concentrating on where I was going, but I’d never walked. Of course I know that it opens in the middle for tall ships, but as Eric Morcambe said, You can’t see the join! It’s totally individual. Show a photo of a tiny portion of it in a Where is This? Competition and it’s immediately recognisable. Over the bridge and down the steps on the left that say To The Engine Rooms, then back under the bridge into The Queen’s Walk, beside the Thames. And there it was! The Gherkin had moved along to the left across the river. I sat for a while to rest in between Tower Bridge and the Beehive building, the Lord Mayor’s headquarters. A Japanese bride and groom were posing for photos. The photographer arranged her train and I saw that she was wearing black leggings under her dress! Walking along the river-bank, I came to HMS Belfast. It’s so long that I thought it was two ships nose to nose. It’s open to the public, but I decided to save it for another time. All the staff became really enthusiastic when they heard about my walk around the area. In one direction were cobbled lanes. (My feet said No.) A pub where a murder took place was ahead, or I could continue to the end of the walk to the left. I decided to keep on walking along The Queen’s Walk. Further along is Hays Galleria; a wharf dating from 1850. It’s now concreted over with huge iron pillars supporting a glass roof. Walk round and browse the boutiques and restaurants in this lovely marine building. Looking over the side and down in the Thames, the tide was low and I spotted traces of an old port, with rocks and wooden beams, possible Roman, or have I been watching too much Time Team? Shuffling along, I went up the steps onto London Bridge and back to catch my train. My feet were killing me, but I’d had an interesting day. The sun was shining and I was surprised at how pleasant and helpful everyone was in this bustling capital city. I’d learnt a lot too. There’s history around every corner. « Have you checked you car recently.